BOOTS 70% OFF SALE - FRIDAY 1st FEBRUARY - STORE OPENING TIMES? Heading to Boots for the boost to 70% OFF SALE Prices In-store? 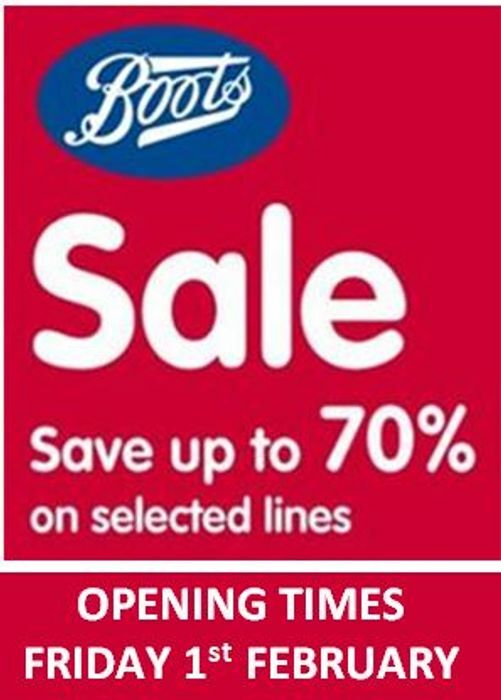 Want to know your local Boots Store 70% OFF SALE Opening Times? Opening times vary by store – and there are over 2,400 Boots Stores! On Fridays Boots usually opens between 7.30am and 9am, and usually closes between 8pm and 9pm. But some Boots stores will be open at 7am, and will close at 10pm. Check your local Boots’ opening times using the Boots Store Locator, click the link above. What deals are in the 70% off sale? Boots said: “Get your hands on our amazing offers from Boots UK with up to a whopping 70% off our seasonal gifts. From Friday 1 February, browse all these offers in-store and pick up a well-deserved treat for yourself or someone you love. Whohoo just need it too warm up a bit so I can get my little car out! !